I was delivering three talks, one on FastMM and debugging and two on OmniThreadLibrary. Slides and source code are available on my blog (click the Presentations link on the left). Organization was spot on (and so was the excellent Italian food :) ) – great thanks to BitTime for setting up the event! All pictures taken with Panasonic Lumix DMC-LX5. This camera rocks! BTW, I have a better answer for your question about server-like TOmniWorker vs. connection pool implemented with threads. 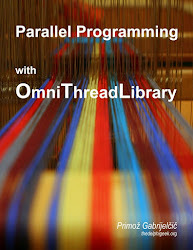 If you implement conncetion pool with OnThreadCreate then you don't have to implement server functionality in the TOmniWorker. Each scheduled task can be a simple, one-shot background task. Your talks was very instructive and interesting.